How many ankles were broken by guys trying to walk around in this strange shoe that really was a boot? I had a purple and black pair that were very thick at the toes, and had huge amounts of plastic heels to give me extra height. The thing is I did not need the height, but they worked, as I needed to keep those flippy floppy flares off the ground. 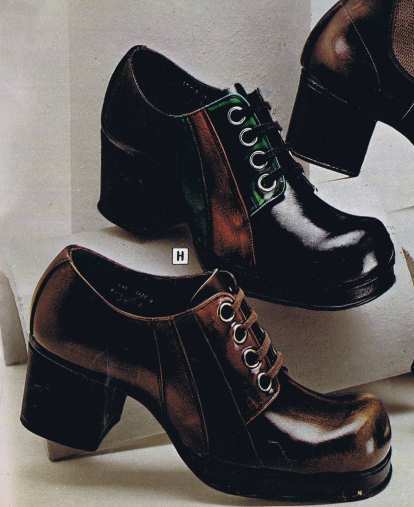 So the Platform shoes by default became a must have 1970s piece of footwear. In some parts of the world, these were also known as Disco Boots. For the guys they were nearly always shoe like, just that they were so colourful and large, and they gave you that lift into the sky. But try dancing with them, and they became a lethal weapon. Moreover, try getting drunk in them too! The ladies had it worse, as they had to wear these stylish shoes that were glamorous and shiny, but again the platforms would make them a lethal item to try to walk with. There were many different shapes and styles and the bigger the platform the better. Tall girls had a problem because too high shoes made them tower over the boys on the dance floor. There again, the guys were wearing them too so it all evened out in the end. You could never really tell how tall anyone was but it was safe to assume that most people were at least 3 inches shorter than they looked. Everyone wore some sort of platform sole shoe in the seventies. The glam rock stars of the era wore huge high heels that would have been impossible to walk in but on the High Street, you could see some extreme variations too. Falling off your shoes was an occupational hazard and health advice raged against the dangers of wearing too high platform soled shoes and the associated injuries they caused. No wonder the habit of taking your shoes off in the disco and putting them in the middle of your group of friends while you danced, along with your handbag, took off with the girls of the 70s! The only problem was that if you pulled a bloke on the dance floor and then put your platforms back on, you might be taller than him for the walk home. Embarrassing all round! !